The premier shopping, dining and entertainment centre in North Myrtle Beach, Barefoot Landing has a lot to offer visitors. 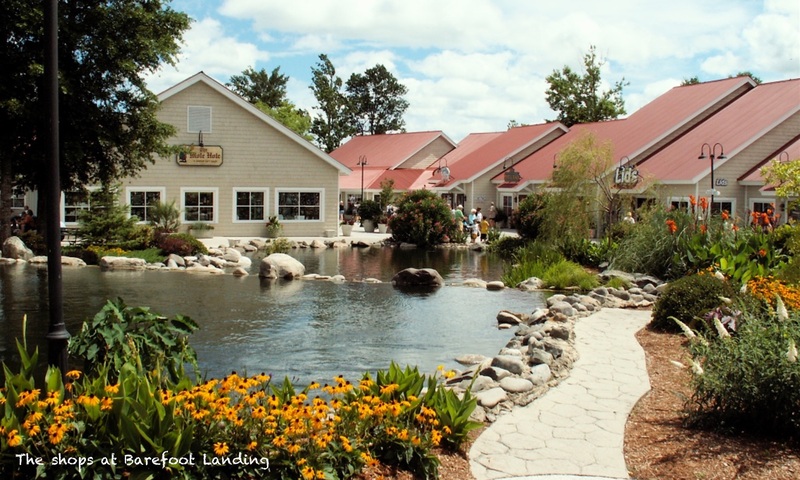 Barefoot Landing is a collection of gift shops, cafés, bars and restaurants built either side of a large lake with boardwalks joining the two parts. Restaurants include the upscale Greg Norman’s Australian Grille which is situated overlooking the Intracoastal Waterway. TBONZ is a popular Steakhouse and there are many others to choose from including Italian, pizza, burger and seafood restaurants. In addition to the shopping and dining, there are several major attractions at Barefoot Landing. Home of ‘One’, which is a southern style music and dance variety show. For winter visitors this transforms into a Christmas show plus there are also guest concert performances as well. Visit their web site for ticket information and the latest schedule. Alligator Adventure is a 15 acre wildlife park and, you guessed it, gaters are the main attraction. However, it is not just alligators. There are rare crocs, lizards, snakes, frogs, monkeys, exotic birds and much more. There are regular feeding displays and other special events. although be aware some things are seasonal. We visited once in January and asked one of the handlers what time the next gator feeding was… He said April! Anyway, well worth a visit so please take a look at their web site for ticket details and more information. House of Blues is a live music venue. There is a restaurant and bar on-site and, apart from the music, they also have special events such as ‘Murder Mystery Dinner Theatre’. You can check out the up to date schedule of events and find out more information by visiting their web site. Or… The Institute of Greatly Endangered and Rare Species. 17 miles south of Barefoot Landing is a 50 acre wildlife preserve which hosts many of the worlds rare species, not just tigers. Many of the wild animals you see featured in films and on TV are provided by this unique sanctuary. Tours are expensive but very exclusive, a once in a lifetime treat for real wildlife enthusiasts. Yet, you can experience some of the animals free at Barefoot Landing. During the summer season from late May to early September, around 5pm, several animals are brought to a location in Barefoot Landing. Find out more about this very special rare animal preserve by visiting their web site. See the Barefoot Landing web site for a full list of restaurants, shops and attractions.